One of Belfast's leading hoteliers has raised concerns over staff recruitment after the UK leaves the EU. New proposed regulations could dictate what type of workers are allowed to come to the UK after Brexit. Howard Hastings, managing director of the Hastings Hotel Group, said the move could cause recruitment difficulties. 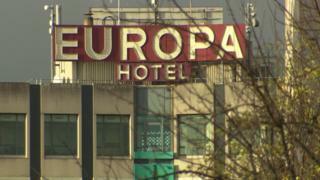 Mr Hastings' hotel group owns several landmark hotels in Northern Ireland, including the Europa Hotel in Belfast and the Slieve Donard Hotel in Newcastle, County Down. He told BBC's Inside Business programme: "I would be very wary that if there is a salary bar on those who can get permits to work in the UK post Brexit, that will have a detrimental impact on our industry. "The demand that we have for skills like chefs and others is one that we will really struggle to meet from the domestic market." Speaking on the same programme, Tracy Hamilton, the director of County Down food manufacturer Mash Direct, said the business community needed certainty in relation to Brexit. "A no-deal scenario is the most uncertain of outcomes - a deal needs to be reached for everyone's sake," she said. Last week, the Confederation of British Industry (CBI) said the proposed immigration rules after Brexit "risk causing significant harm" to NI businesses, which could face "severe difficulties" getting staff. The Home Office said the future system would "support businesses", but firms should train local workers. Some sectors in Northern Ireland, such as food and drink manufacturing, are heavily dependent on workers from Europe. Inside Business is broadcast on BBC Radio Ulster on Sundays at 13:30 GMT and on Mondays at 18:30.